Ground Floor 3BRM Lakefview unit with private Boat Slip! This lakeview unit at Emerald Beach Villas is an air conditioned, THREE BEDROOM, ground floor, end unit and is a generous 1250 square feet, with a large patio opening up to the vast grass courtyard and only 50 feet from the pool and hot tub. The plan is bright and open. This unit has a private boat slip in the marina. The unit easily sleeps six - MAXIMUM 7 PEOPLE. The master bedroom has a pillowtop queen bed, full en-suite bathroom, door to patio, and a 27 inch TV in the armoire. The second bedroom also has a queen bed. The third bedroom has a bunkbed, with a double bed on the bottom and a single up top, and also has a 20 inch TV with VCR to keep the kids entertained. There is a large maple kitchen, which is fully-equipped, including a microwave and dishwasher. The dining room table seats six, with room for eight. The living room has a 35 inch TV, stereo with CD player and a DVD player with surround sound. There is also a desk with free access to a high-speed internet connection and wi-fi. The large patio has a seven piece patio set and a gas grill. There is also an en-suite washer and dryer, and all linens and towels are included. Emerald Beach Villas was finished in 2003 and sits directly on the shore of Wood Lake, with 350 feet of sandy beach and lots of grass area. There is a swimming pool, hot tub, fitness room, recreation room with a pool table and an outdoor sport court. Wood Lake is six miles long, running from Lake Country to Oyama, and connects directly via canal to Lake Kalamalka, which is 14 miles long, stretching from Oyama to Vernon. We are also located beside a 20-acre park with a jogging track, and soccer and beach volleyball facilities. Located only 200 meters from the newly completed Okanagan Rail Trail which runs from Kelowna to Vernon. Miles of walking, running and biking trails at your door step. The owners have spent a great deal of time and effort furnishing and equipping this unit so that your vacation will be a memorable one. Most guests book year after year so booking well in advance (12 months) is recommended. We rent the units by the day from May 1 to the third Saturday of June each year. From the third Saturday of June to the last Saturday of August, we rent the C101 by the week, Saturday to Saturday. We do not rent the TH5 unit during this time. We rent both units by the month September 1 to April 30 each year. Sharon and I absolutely love Emerald Beach Villas! With a group of friends, we were the original owners of this property and provided the vision for the redevelopment of the property into EBV. Lake Country is a pristine small orchard community, but yet close enough (20 minutes) to Kelowna and Vernon for shopping and services. 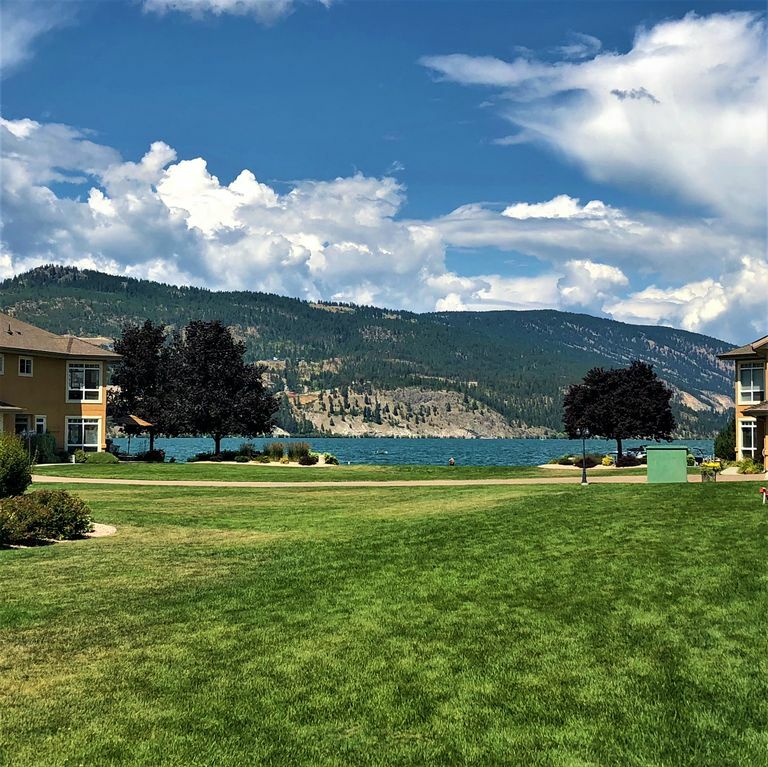 10 minutes to Kelowna Airport, numerous golf courses, wineries, hiking and biking trails including the newly complete Okanagan Rail Trail which runs from Kelowna to Vernon. Wood Lake is the best lake in the Okanagan for water sports. Our location has a 350 foot stretch of beach. Common room with pool table, gym and sports court. Please make all checks and money orders payable to Rosenberg Family Trust in Canadian Funds. We rent the units by the day from May 1 to the third Saturday of June each year. From the third Saturday of June to the last Saturday of August, we rent the C101 by the week, Saturday to Saturday. We rent by the month September 1 to April 30 each year.